I recently had the pleasure of having to secure a tax agent (tongue in cheek) to assist me with a tax return. During that lovely experience I was asked to sit and wait patiently whilst the person I had the meeting with was running an hour late. Bloody hell, it was 9am! 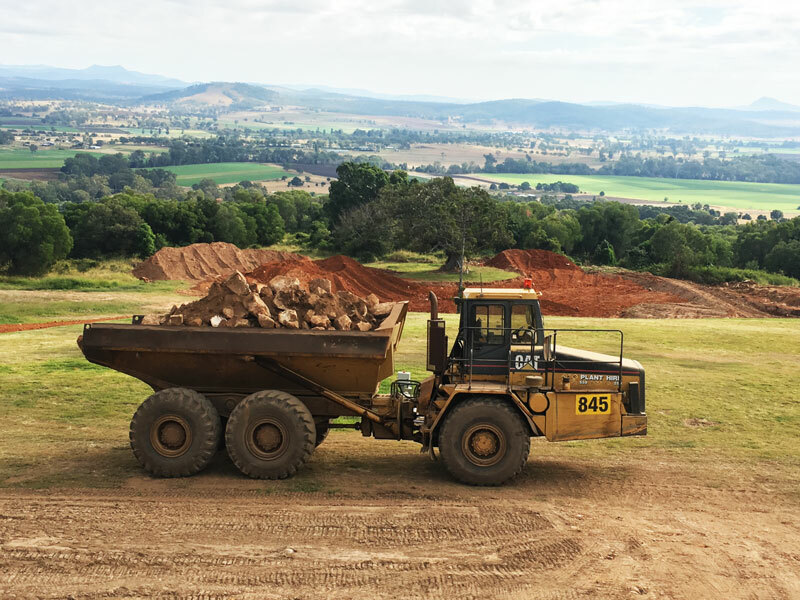 With all the time in the world to do nothing, my mind wandered back to our industry of construction, mining and earthmoving. How on earth could we get away with just not turning up for work, say, till smoko, and not have to explain to the client with a very good reason why ? The sterile, almost hospital like, confined space where no one talks, no music, no fresh air, no banter or humour and the rigid, almost anti-social, approach to anyone not wearing a suit confirmed once again to me that we live and work in the best of environments with the best of people. I could not exchange our lifestyle for that type of environment to place me in such a negative workplace. The wide open spaces, clear skies and fresh air should never be taken for granted – we are so very fortunate. 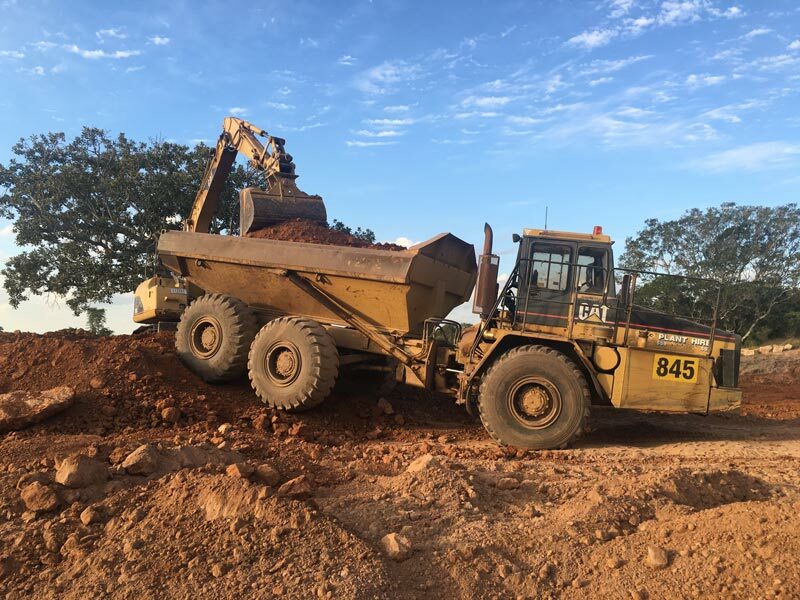 Fast forward to the pub on a Friday night and I met up with one of the true blue Aussie battlers who just love the earthmoving game in all its glory. Trevor Baker has a few machines, reads and loves Earthmovers and Excavators, follows the deals in TradeEarthmovers.com.au and is the sort of bloke who just loves getting down and dirty when not in the operator’s seat. Interested in our reviews, he asked what machines we could be reviewing in the near future and after I told him of my wish list he said he could help out with an old Cat D250E articulated dump truck with a story behind it. Perfect! Now, Trevor is not the conforming prima donna operator we are so blessed with in so many areas today. He is old school, loves to buy cheap, loves to repair and get dirty, loves the challenges associated with machinery and just loves working them as a multi-machine owner/operator. A few beers and a feed with the boys, an early night and, just as Trevor promised, at 6.30am the float pulls up the gravel road and into the farm with the Cat 25-tonne dump truck proudly atop the new drop deck behind the cab-over ‘Kenny’. Now, up here at our Earthmovers & Excavators testing grounds on the mountain we are always looking for gear to test run. We had engaged a D6R III in to push or rip a water storage dam in some decomposed material, which had proven a bit tight for the digger. 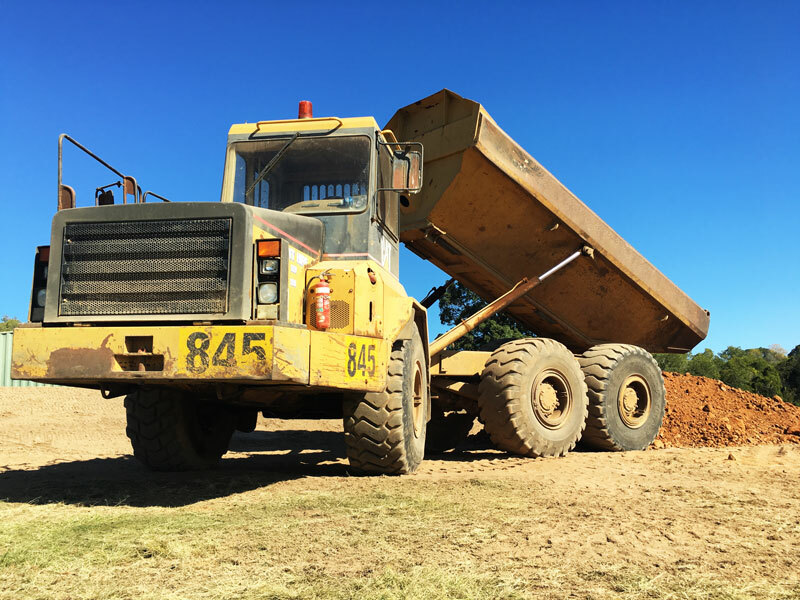 With the expected volume of a couple of thousand cubic metres of road-base materials and topsoil, the D250E would certainly come in handy and, in doing so, give us the opportunity to test run and old machine in a full working environment. The history of this machine is interesting to say the least but, as I was to find out from Trevor, it’s how he does business. Money is always tight in the bush and with Trevor it’s no different. There is no big cash left over at the end of the year to go buy new or really good used equipment. But, as Trevor is a fully qualified diesel fitter and handy at just about everything most of us are not, he loves the challenges and buys a lot of his gear deemed as being "left in the long yard" or, to you city blokes, "retired for scrap". 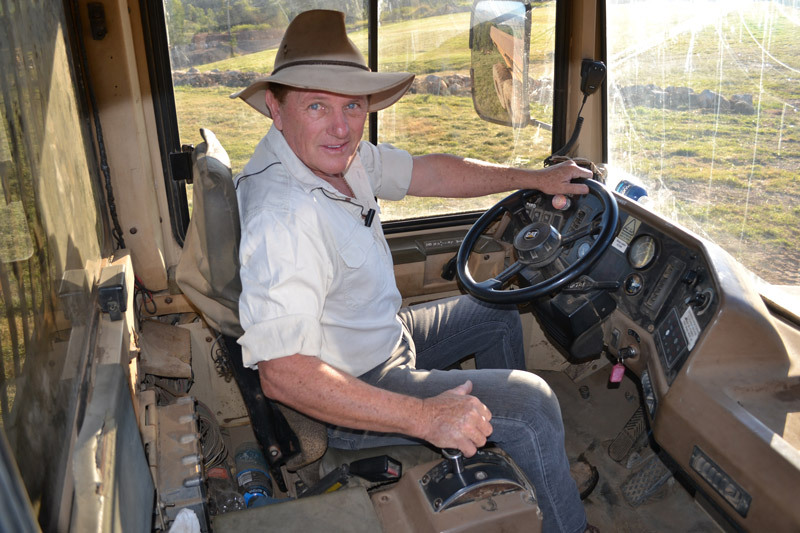 The "Op Shop for diggers" – commonly known as the wreckers – is where Trevor plies his skills and finds some equipment he deems suitable for refurbishment back as his Aratula workshop. This was the case with the Cat D250E dump truck. Bought from a wrecking yard for a very reasonable price, the truck looks every bit its age of more than 20 years old. Visually and from a distance it looks okay but it’s the close up bits that show she has been worked in a salt environment. It’s an early- to mid-90’s model with 18,000 hours on it, partially rusted-out guards and, with a few oil leaks, Trevor has gone over the truck and done the necessary repairs to make it operable and safe. Sure, many would go the extra mile and tidy it up but with his motto of "they get what they need, not what they want to keep ‘em going", Trevor keeps his costs down until some positive cash flow starts – then he re-assesses the situation on each machine. His machining and fitter skills in his well-decked-out workshop are renowned throughout the area and he often takes on outside work to help the rural and farming community, often working till 3am in the morning before heading back to his own works. 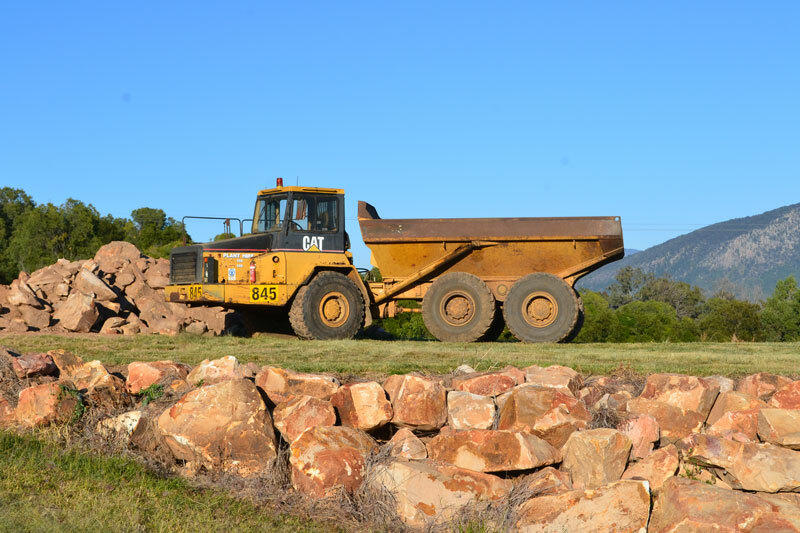 The Cat 25-tonne dump truck was put to work immediately. After all, we only had it for a day or so. 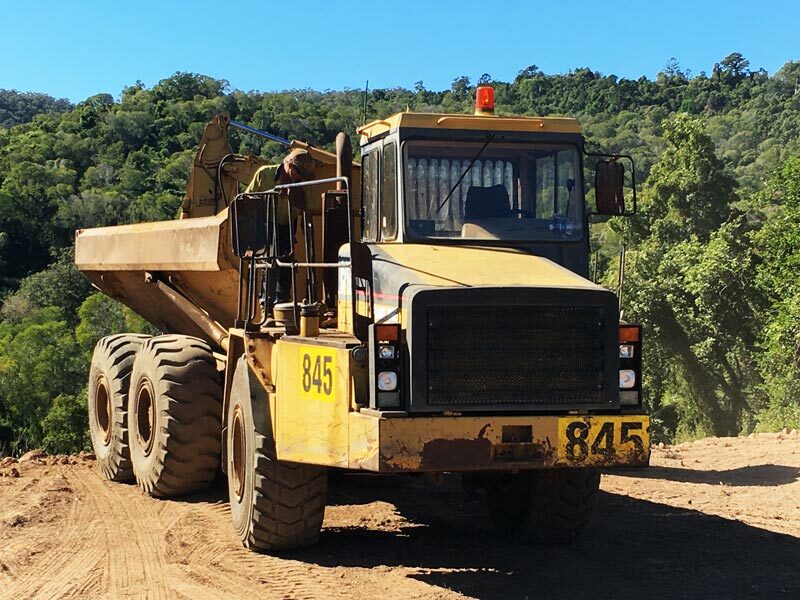 Being loaded with a Cat 12-tonne excavator, the deco road base proved to be just what we needed to give our access tracks a bit of a touch up. The beauty of being in the bush and having multi-use materials available is that your costs can be cut dramatically – if we had to import this road base material it would be in the vicinity of $40,000. It’s a bit better in quality but after we get some rain and put a roller onto it we can trim it up in our own time; win-win-win here. Running a 260hp (194kW) turbo-diesel engine and weighing in at a neat 20 tonnes unladen, this old girl runs like a dream. You can load her up to the manufacturer’s suggested limit of 22.7 tonnes, but if you are greedy like us you can go a fair bit further than that. These trucks really are a gem to drive even at the ripe old age of 20. The transmission worked like a clock with no leaks, no vibrations, no adverse groans or moans, and shifted on cue with the tacho. Once inside, the cab was surprisingly good with all the gauges working and, as with all Cat gear (even this old), sitting smack bang and clearly visible in front of you with no second guessing what particular gauges mean. Full glass is still intact and clean, and a perfectly set air-conditioning unit just makes life that much easier. By the way, this was tested during our Queensland winter months of July with 25- to 27-degree days, so eat your hearts out, southerners. The steering arms had some wear but definitely not warranting any work on them at this point in time. Trevor did not say if he had re-bushed them at any time whilst in his possession … overall direct steering with a little play but that’s in all of them. However, the big winner was the brakes. You don’t want to be operating these units on side slopes or hills with dicky brakes. The brakes on this unit were perfect. 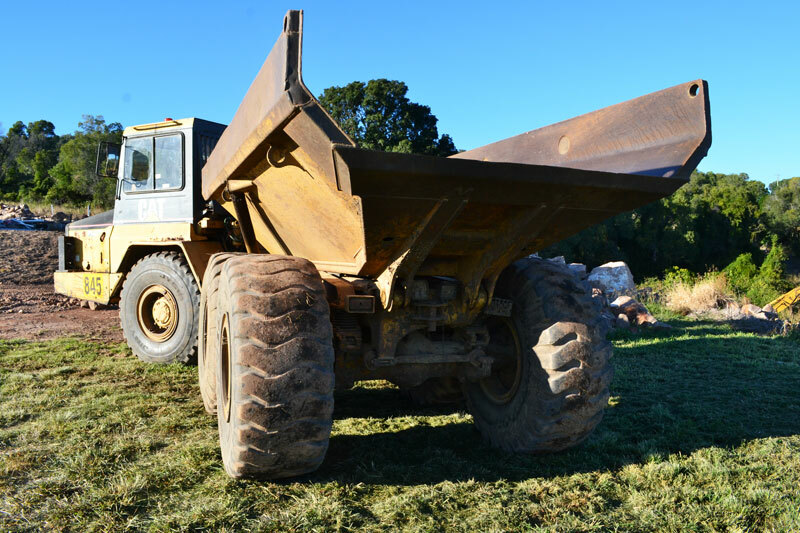 Near-brand-new tyres were fitted to the front of the unit and, with the use of the left-foot-controlled, floor-mounted diff lock switch I found the D250E had no problem in traversing the hilly terrain fully loaded and with loose material underfoot. When tipping our overfilled-to-capacity loads, the hoist rams worked well with only a minor leak but were powerful and fast both on the hoist up and down. Hydraulic hoses are always going to be an issue and can be a problem from brand new or 18,000 hours old. This was the case when we blew a main hydraulic hose from the pump to the hoist rams, which caused us a bit of light grief but only in downtime. Trevor was onto it immediately and showed me just how efficient he is when it comes to breakdowns and repairing of those. Lifting the bonnet is not for the weak but everything is reasonably accessible once there, which is typical in a Cat-designed machine. They are usually well designed with the serviceman and access to those relevant items is well considered. Overall, the Cat D250E, albeit 20 years old and suffering many beatings in its life, is now in the hands of someone who understands its capabilities, has a passion for fixing and repairing more than operating, and has the soft hands to gently guide it through its next stage of life. After all, Caterpillars are "built to be rebuilt". Trevor Baker is the sort of bloke you would like to be in the trenches with – knowledgeable, practical, considerate, and tough as they come. Maybe I should introduce him to my tax agent as I’m sure Trevor could give him an attitude adjustment on life … it’s possible that it is well overdue.